Aiming to develop winter tourism and attract more foreign tourists to Mongolia, the country will hold an annual ice festival called “The Blue Pearl 2019” next month, as per media reports. 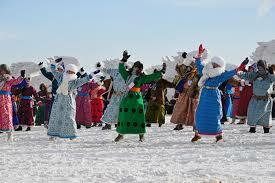 The Festival will be held at Khuvsgul Lake on March 2-4. The three-day event includes a folk music concert, shamanic ritual ceremony, shooting game on ice, sled dog racing, tug of war competitions on ice, horse sledding race and ice skating. According to the Mongolia’s Environment and Tourism Ministry, the influx of foreign visitors to the country has been growing from year to year. The Mongolian government has set a goal of hosting 1 million foreign tourists and earning 1 billion U.S. dollars from tourism in 2020, NAM News Network reported.